Meet with members of a local musical group in Cienfuegos and learn about their careers as musicians. Enjoy lively interactions at a local Senior Center. Learn about conservation and enjoy lunch at a beachfront private enterprise. Delve into the rich history and heritage of Cuba. In the heart of Havana and Cienfuegos, meet members of the local communities to discuss their lives and cultural traditions. Meet face-to-face with community leaders, local residents, artists, and intellectuals to discuss Cuba today and explore local landmarks that are significant to Cuba’s cultural heritage. A trip of a lifetime! Scanning the catalogue for my next adventure! This program exceeded all of my expectations and makes me hungry for more! The sights and sounds of Havana thrill the senses, and the openness of the people I encountered challenged any erroneous or biased assumptions I may have held. The excursions to Cienfuegos, Trinidad, and Santa Clara were equally rich. I feel that the depth of cultural and political knowledge I gained through this program could not have been achieved elsewhere, or with a more delightful group of people. Our Cuban trip was delightful with wonderful in-country programs, great accommodations, charming restaurants with delicious meals and very comfortable buses. The March weather was delightful. Make this trip before travel from the US inundates the island! Activity note: Please note: This day-by-day schedule should only be used as a guide since program elements are subject to change as availability is controlled by the Cuban government. Afternoon: The Road Scholar Group Leader will be in the hotel lobby at 4:45 p.m. to accompany the group to the orientation room. Welcome and orientation begins at 5:00 p.m. This very important meeting prepares you for our educational program and travel in and out of Cuba. We will review the up-to-date daily schedule and any changes, responsibilities, safety guidelines, emergency procedures, and discuss U.S. Department of the Treasury, Office of Foreign Assets Control (OFAC) regulations that govern our program. Flight times to Cuba are subject to change and will be confirmed during Orientation. The day-by-day schedule in Cuba is a representative guide only as program elements are controlled by the Cuban Government and are subject to change on short notice. Activity note: Please note: Most staircases in Cuba do not have railings and sidewalks are uneven. All accommodations in Cuba feature clean, comfortable rooms with private baths and standard amenities. Please note that Cuban hotel standards may not equal their American or European counterparts. Improvements are ongoing, and we hope that the potential glitch in service or amenities is a minor trade off for the authentic connections and enrichment you’ll experience. Breakfast: Breakfast at the Miami hotel. Morning: Morning departure from the hotel to the terminal (final flight times will be confirmed during orientation). The Road Scholar Group Leader will meet the group in the hotel lobby to transfer to the airport. Please be in the hotel lobby with your luggage and be ready to depart the hotel 15 minutes before departure schedule. Transfer to the airport and check in to the flight to Cienfuegos. Flight times are subject to change and will be confirmed in the Final Information Packet. Upon arrival in Cienfuegos, enjoy a welcome greeting by an experienced bilingual Cuban Guide, who will be with us for the entire program. Lunch: Lunch on own in Miami Airport. Afternoon: Upon arrival in Cienfuegos, explore the city and enjoy a short walking tour through Plaza Jose Marti, the main square in Cienfuegos. Talk briefly about the square's history while you have the opportunity to see local life and observe the beautiful buildings that surround it, including the Tomas Terry Theater. People Connection: Enjoy interactions with an orchestra and discuss their musical careers, how they studied their art and what a typical day is for them. Check in to the hotel. Dinner: Dinner buffet in the hotel at leisure. Activity note: Strenuous walking up to 2 - 2.5 miles over uneven cobblestone streets in Trinidad with limited shade and places to sit. The historic center of Trinidad is not accessible to motorcoaches and must be accessed on foot. Breakfast: Breakfast buffet in the hotel. Morning: Depart on a full-day excursion to Trinidad, the crown jewel of colonial Cuban cities. Founded in 1514, this time capsule of a city is a mix of historic landmarks and majestic natural beauty. On foot, discover the historic center of Trinidad with your Cuban Guide. Walk to Plaza Mayor to explore the historically and architecturally significant landmarks of this colonial town. People to People Connection: Pause our walk through beautiful Trinidad to enjoy an enlightening encounter with the owner of a free-enterprise "casa particular" or Cuban bed-and-breakfast. This is the perfect place to learn about the relatively new development of independent business in Cuba, while understanding the owners' story and how they transformed their home into a casa particular. Before going to lunch, look in on an artist who carves the faces of everyday Cubans in discarded wood he finds on the streets. His work has been featured both in Cuba and in the United States. Lunch: Lunch in a paladar in Trinidad. Afternoon: Free time for independent exploration. Return to Cienfuegos. Dinner: In a paladar near the hotel. Activity note: There will be standing and walking through the Che Memorial & Museum for about an hour with limited places to sit. The center of Santa Clara is inaccessible to motorcoaches and must be accessed on foot. Morning: This morning, discover a local Farmers Market, where you have the opportunity to talk with local farmers about their produce. Depart on a full day field-trip to Santa Clara, the beautiful provincial capital of the region Villa Clara. People to People Connection: Enjoy lively interactions with a vivacious group of senior citizens. These young-at-heart folks share their leisure activities and discuss how some Cubans enjoy retirement. Lunch: Lunch in Santa Clara. Afternoon: Visit the Che Guevara Memorial and Mausoleum which features unique historical pieces from one of the most influential revolutionary leaders. The displays chronicle the events of an era in this extraordinary man's life. The mausoleum is the final resting place of Ernesto "Che" Guevara and his companions. Return to Cienfuegos and stroll through the main shopping street of to learn the differences between ration, Cuban pesos and CUC stores. Explore the complexity of the two-currency system and have the opportunity to talk with Cubans and workers who shop at these stores. People to People Connection: Enjoy a performance by one of Cienfuegos’ youth dance groups and talk about their lives. Dinner: Dinner in a local restaurant. Activity note: Travel by motorcoach. Walking and standing in the museum for 40 minutes. 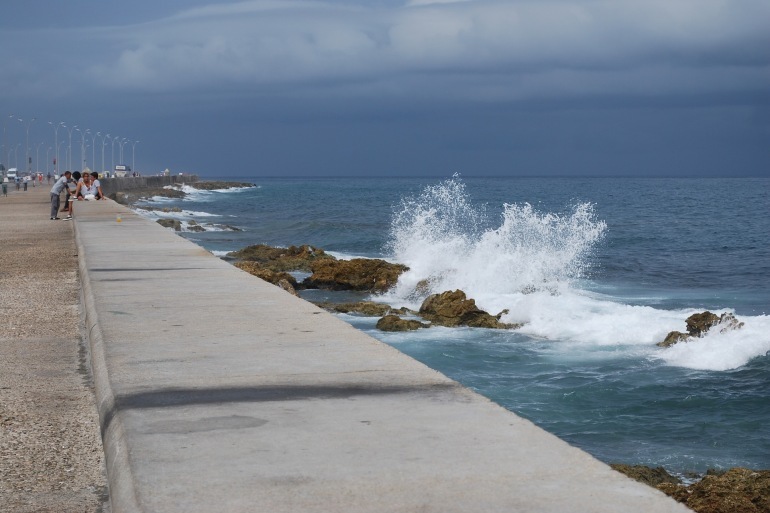 Walking up to 2 – 2.5 miles over uneven cobblestone streets in Cienfuegos with limited places to sit. There may be time during the lunch stop to swim in the Caribbean, so be sure to pack your swimsuit. Morning: Depart from the countryside to the capitol of Havana. En route, stop at the Playa Giron, also known as the Bay of Pigs, a small coastal village and the site of the historical 1961 clash between CIA-trained Cuban exiles and Cuban rebel forces. Explore the small Bay of Pigs Museum, which reveals the Cuban perspective of the infamous invasion and houses many historical artifacts including a Sea Fury fighter aircraft, photos and maps outlining each step of the failed mission. Continue on to Zapata Swamp to learn about ecology and conservation in Cuba. Lunch: Enjoy lunch at a privately owned seaside restaurant, with an opportunity to take a short swim in the Caribbean or a walk along the beach. Afternoon: Arrive in Havana and explore Colon Cemetery with a local expert. Learn the stories of the monumental architecture and of the famous Havana personalities who are buried there. Head to the hotel and enjoy a welcome cocktail. Dinner: In the hotel's restaurant. Activity note: Walking and standing up to 2 - 2.5 miles over uneven, cobblestone streets is required in Old Havana. Morning: Today’s presentation is on the history of U.S.-Cuban relations with an expert in the field. Gain an understanding of the Cuban perspective of the tumultuous relationship between the two countries, followed by open discussion on the topic. Next, discover the first two of four "plazas" in Old Havana: Plaza de la Catedral and Plaza Vieja. Each square has its own unique features. Lunch: In a paladar, (a privately owned restaurant). Afternoon: Discover the second two "plazas" of Old Havana: Plaza de San Francisco de Asis, and Plaza de Armas. People to People Connection: Meet with members of a graphic arts cooperative and discuss what they do. Dinner: Your choice to explore the many new privately owned restaurants (paladares) in Havana. The array of possibilities is constantly growing. A list of suggestions will be provided. Activity note: Walking and standing outdoors for one hour at Finca La Vigia, with some uneven stairs with no railing. Morning: Enjoy an expert presentation focused on the perspective of Cuban young professionals. Learn their hopes for Cuba's future. People to People Connection: Observe a rehearsal then enjoy conversation and interactions with a modern dance group. Lunch: Enjoy lunch in a paladar and hear the owner’s story of how they operate and source ingredients. Afternoon: Drive to the outskirts of Havana to Finca La Vigia, the Hemingway Farm. This beautiful property hosts the house where the Nobel Prize-winning author lived with his third wife Mary for over 30 years. Look into the open windows and doors to see the home in perfect condition with Hemingway’s personal belongings as he left them. Walk the grounds to see his private writing studio, swimming pool, and beloved fishing boat, Pilar. The boat is featured in his novel "Islands in the Stream." Dinner: On your own to explore a paladar. Ask your group leader for suggestions. Activity note: Walking and standing for 2 hours at the Fine Arts Museum. The museum does not have an elevator. Walking and standing outside at La Cabana Fortress on uneven cobblestone streets. Morning: Today’s presentation focuses on the role of religion in Cuban Identity. Field Trip: Explore the Fine Arts Museum of Havana. Cuban art is renowned world-wide. Delve into the stories that each work of art relates and the statement on politics, culture and society that each artist conveys. Lunch: Light lunch in a paladar. Afternoon: Explore the Fortaleza de San Carlos de la Cabana, also known simply as "La Cabana." This fortress protected the mouth of the Havana harbor in its day and offers unique views over Havana - ideal for gaining a better understanding of the city's layout. Return to Havana for another People to People Connection with young Cubans. Dinner: People to People Connection: As an “appetizer”, enjoy a performance by a women’s a capella chorale. This is an opportunity not only to hear beautiful voices, but to discuss what life is like for women today in Cuba. Then enjoy dinner in a paladar. Breakfast: Breakfast in the hotel. The Hotel Jagua is a resort-style hotel, with a magnificent location in Cienfuegos’ well-known residential area of Punta Gorda. The Jagua is considered one of Cuba's most famous hotels. Its comfortable rooms are characterized by the spaciousness of the 1950s and offer beautiful panoramic views.